Josephine Langford and Hero Fiennes-Tiffin continued promoting their new film ‘After,’ at the LA premiere held at The Grove on Monday night (April 8). 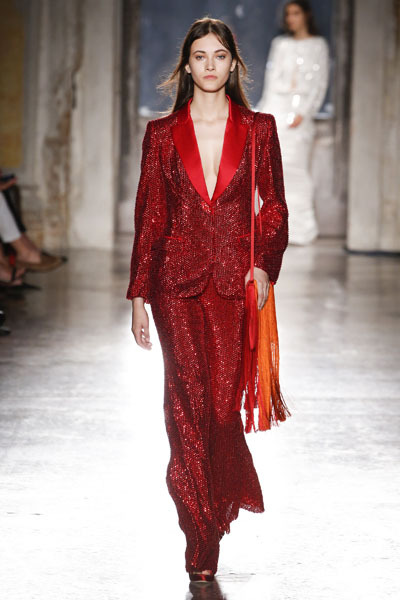 Josephine Langford: I love how the lively charm of the red sequins balances the impeccable tailoring of her Alberta Ferretti Limited Edition Fall 2018 suit. The colour is breath-taking, and like how the satin lapels amp up the luxe appeal, but I can’t help feeling that this would’ve been served better by Jane Fonda or Helen Mirren. Hero Fiennes-Tiffin: The 21-year-old actor has been showcasing his flair for sharp suits, going from custom prints, to classic tailoring with a twist. On this occasion he gave us some heritage in this Prince of Wales check suit, which he swift added some youth appeal via the sneakers.